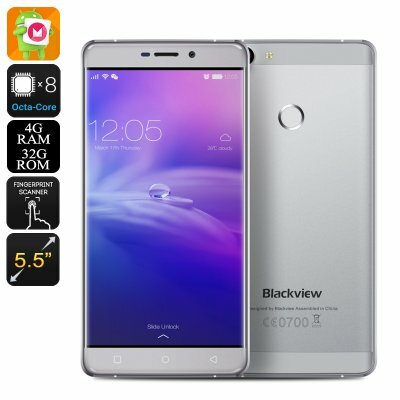 Successfully Added HK Warehouse Blackview R7 Android Smartphone - Android 6.0, 4G, 5.5 Inch, Dual SIM, Octa Core Helios P10 chipset, 4GB RAM (Grey) to your Shopping Cart. Unlike most mid-raged Smartphones the Blackview R7 has been equipped with a 5.5 Inch FHD display. Thanks to it’s 1920 by 1080 pixels this phone packs a mesmerizing 400 pixels per Inch and is capable of portraying sensational detail. Watching video’s, pictures, and playing games on this cell phone is guaranteed to bring you a user experience like no other. With its Octa-Core CPU running at 1.95GHz, 4GB of RAM, and Maile-T860 GPU this phone packs some serious hardware that brings along an exceptional performance. With Google Play installed on your phone you now have access to literally millions of Apps and games that you can enjoy without dropping any frames. Along with its 3000mAh battery you can be assured that you can enjoy all the magnificent features of this Smartphone for a full day worth of time without having the need to worry about battery life. The Blackview R7 holds up to two 4G connectivity SIM cards which, thanks to its double IMEI number, can both be active at the same time. With two active SIM cards you can easily separate your work and private life while being connected to two different network providers at the same time. From now on you will always be within reach to your contacts and able to access the fastest data connectivity available on the market. On the rear of this beautifully designed Blackview Smartphone you can find a fingerprint scanner that will help you to secure your phone along with all its data with biometric security which means that no longer you have to worry about remembering PIN codes or screen patters as now your Smartphone can be easily unlocked by a touch of your finger. Its Smart-Wake and Smart-Gesture features furthermore allow you to easily open and navigate through all your favorite apps. The Blackview R7 Android Smartphone comes with a 12 months warranty, brought to you by the leader in electronic devices as well as wholesale China Phones..